After receiving a few emails from illustrators and friends asking what kind of things I did to get my recent assignments I've decided to make a blog post on the subject. I still find it very useful to read how other illustrators promote themselves or what steps they took to go from unknown to getting their foot in the door, so just thought I'd add my own story here from start to finish. In the beginning I was terrible, and I knew it. I had been trained as a fine art painter and knew how to paint what was in front of me. Painting from the imagination is a whole different ball game. I also knew next to nothing about composition. It was just....ghastly. So...I practiced---a lot! I have painted probably hundreds (thousands?) of paintings, many of which were done over and over to 'get it right' (and will never see the light of day). Looking back over my work, I have improved greatly - I just didn't have the chops at all when I started. And I was not a natural. I went to the library constantly, checking out tons of books by my favorite illustrators for both inspiration and to learn from them. I accumulated some serious late fees (oops). When I started sending my own stuff out, I got lots of rejections and only a couple notes saying they kept my work on file. This continued for a couple years more - --I didn't know that this is the norm and that I just had to hang in there and be patient. It's hard not to take rejection personally! Finally, my illustrations started to improve. A kind illustrator friend of mine took me under her wing and told me about Cornell and McCarthy and how great an agent they were. I held my breath and sent my best pieces to them, all presented in a folder with matching cover letter etc. Weeks later, they accepted me! Hoorah! I was over the moon. Almost another year went by and I still didn't get a whole lot of work, but this was expected. I was a new artist and there was also a slump for just about every illustrator I knew. Finally, I began receiving a steady stream of educational work. It was an excellent way to get my foot in the door and get a feel for how the publishing world worked--and it was fun! Almost 90 percent of the projects I illustrated never got back to me in print which surprised me. I guess since edu publishers are working with so many artists at a time they would lose a lot of money sending everyone copies of their printed work. I often bought my own books if I was able to find them. I started to set my sights on being a trade book illustrator and eventually, an author as well--but I put all my energy in the former trusting that the other would possibly follow if I was successful. Many more years passed (for the most part, documented in this blog) of struggling to improve my art and find my style. Since I wanted trade books, I started adjusting my art to look more like trade book art and found that I was more comfortable with that direction and enjoyed it immensely. But I still needed to put in more practice. And I did--I was hard on myself, doing scenes over and over again and probably being overly critical. I kept posting to my blog on a regular basis and found the community of other blogging children's illustrators to be extremely supportive and encouraging. I would post something, see the responses, and it was sort of a ping-pong effect of bouncing ideas back and forth. I commented on other artist's work as well. We had all found a little nook away from the mostly solitary atmosphere of being an illustrator. As my art started improving and reaching a level that I felt was 'ready' I started chomping at the bit to get my first trade book assignment. I began doing anything and everything that would get my art out there. Sure, I have an agent promoting me, and I can't begin to express how much Cornell and McCarthy have impacted my career, but you also have to do your part (I believe) and I started sending out extra postcards, updating my website often, and advertising on childrensillustrators.com (I have received many assignments through them, they are absolutely the best out there). Argh! What was I to do? Then one day my agent offered to send out a Christmas card to everyone on their client list with my illustration on the front. This is something they do every year and each time, they pick an artist from their group for the job. I jumped at the chance! Coming up with a design was difficult - I was putting a lot of pressure on myself and you know how that goes. I couldn't come up with anything I liked - I filled a sketch book with ideas. Finally, with the suggestion from my very smart agents, I went back to my favorite subject--PIGS! The ideas finally flowed and I came up with the two designs in this post. The image of these two pigs was finally chosen. After the card was sent out, it was a quiet holiday season, then boom! January/Feb hit. I started seeing some big publishing companies on my website stats, and .......they were googling my name to find me! Wowee! Even if I had not received any assignments, this in itself was something to celebrate! They had shown interest. A few months following this initial reaction, I received three trade books in a row and most if not all said they had seen and liked the Christmas card. It just goes to show a couple things--draw what you enjoy drawing the most and your best work will no doubt come out, and two, you never know which sample will get the attention of art directors so keep sending them out. In the end, you have to love what you do. It was a long road of five or six years before I came to this point in my career, and had I been wishy-washy about being an illustrator, and not put everything I had into this dream, I wouldn't have made it this far. The love for your craft gets you through the hard times and the rejection letters, and the months without work. Then one day, unexpectedly, things begin to finally fall in place (and they will if your heart is in it) and it's really quite a feeling when that happens. I still have lot of hard work, learning and practice ahead of me of course - and always will, because the art of the picture book is a complicated and beautiful thing. I adore the piggies under the mistletoe. It is absolutely adorable. I am definitely a fan of your work! My goodness, you have such fabulous taste in so many things! U2?? The Police?? Harry Potter? What kind of books do you write? I just don't get tired of saying you are truly talented and such a hard worker too. I knew it was a matter of time before book deals started coming in for you! The hardest thing is being patient I think. This is a very slow business, emphasize of the "very".. But you give great advise, we have to keep believing in what we love and keep on working hard. I loved reading this. It made me feel like I am on the right track. I always feel like I am reading other illustrators blogs and they get an agent out of school and seem really busy. I have an agent in chicago but like you, its been about 6 months, not a lot coming in for me. I just need to stick to it!!! Which I am! Thanks for your honesty and such a fantastic post! You deserve all your success. You're the hardest working illustrator I "know". Love the pigs!!!! Thanks for this post. I find that starting out for the second time is harder than the first. How do you know who is looking at your site from the stats? What program are you using? I'm very interested in how you've change you style over the years from more realistic to lighter and trade worthy. I love doing my style, but it is painfully slow! I'm really thinking about what I could do to change/speed things up. Awesome, awesome post Paige. I knew from the moment I met you that you were going to be a great success. You've worked so hard for it and you are a testament to the fact that all the effort does pay off. Wow, Paige, that is a very generous post! 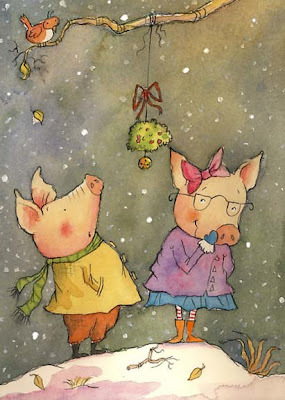 The piggies under the mistletoe is one of my most favorite illustrations of yours. You really nailed that one! Continued success to you. You so deserve it! And thanks for the inspiration! Thanks so much Paige... this may mirror what many of us are doing and gives us hope for the future. Hanging in, working hard, and of course more working hard. Your images have always delighted me right down to my piggy toes! My books are listed on my blog on the right. They are children's picture books....mostly Knights and Dragons and stuff like that. Great ost and very useful,love your pigs and everyone can see how much you love them. I've always enjoyed your blog, Paige -- so honest and dedicated. And I just love your charming style. It's reassuring to read that you have to work at this. Thanks as always for sharing! Thanks so much for taking the time to write this. It's so encouraging to know if you keep at it things can happen! The image you sent out on the Christmas cards is one of my favorites. Oh Paige, what a cool story. I adore your mistletoe pigs. I think it's the combination of their expressions and individuality, and also the colors and paint application. Your ice skating piggie is a favorite of mine for the same reason. Well done Paige, and congrats on your 3 trade books this year! Laura, I use statcounter (statcounter.com) for my stats. It tells you everything about your visitors--practically down to what color their pajamas were when they visited your site. It's THAT detailed lol. You can also choose to have it invisible and it's FREE. Thanks, Paige! I can't wait to buy your books in the store. Keep us posted!!! Great blog post Paige, and I love the christmas card! This is great! Thank you for sharing, it's always good for me to hear another illustrators story. 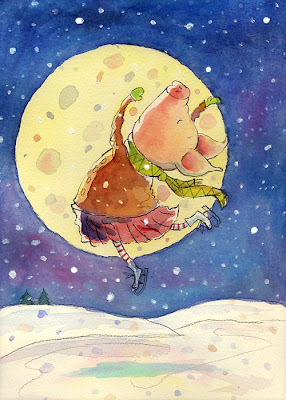 I really like your night scenes, the pig "ice dancing" in front of the moon, magical! Such a wonderful story! Thanks for sharing. And of course we all want to see your books soon!! I appreciate you taking the time to put this online. It is stories like this that keep those of us at the beginning of this journey inspired to continue and to see the light at the end of a long tunnel. I once heard someone say that they knew they were in the right career because it was something they would do for free. That is how I feel about illustration. Best wishes on your continued success! Beautiful blog post. Thank you for posting your story, I too appreciated the time you took to write all of this out. No matter how many blogs I read the posts that seem to bring me the most joy are about other illustrators making it. While in some ways we are all each other's competition, I've never seen things this way. I feel like a silent and happy cheerleader clapping at everyone's new work and success. Good luck for many more years of setting goals and meeting them! Wow Paige, thank you for sharing your inspiring story. Wishing you many more years of delightful illustrations and success stories! I just now read this story, its quite inspiring, especially for those of us waiting out the dark years before getting our dream book deal. I like your piggies too, what sweet expressions. Thanks for sharing! holy smokes, I'm honestly about to cry.. . ok, I am crying... in gratitude to you for sharing your story, in the hope that you've given me and in the accomplishments a fellow human being (you) was able to achieve by persisting in their dream.. Man, I dont know if I'm just emotional or what, but thank you... from the bottom of my heart for sharing your story and in turn encouraging me to pursue my dream of becoming an illustrator some day.. I've got a looooooong way to go for sure... but this has been a great help.. thank you sincerely. I can't believe I came across your post just when I needed some inspiration... I just wonder if I'm ever going to get there or not? I so identify with you since I'm at the stage of checking out library books and studying other artist's styles. Anyway thanks for sharing. Anyhoo....thank you so very much for sharing this very personal and heartfelt story of your journey with us. Very inspiring! I have just read all the article, then I read it out loud to my husband... for the moment he is at the stage: no imagination! But other wise I would say I find a lot of similitude with my experience as an author! wow... thank you for sharing this. i really appreciate it. i hope that one day i will become a great illustrator as you are. ps: many thnx for letting me follow the blog! Thanks for sharing, Paige. I always love to hear how other illustrators got their breaks. This was so great to read. Thank you for sharing and being so open with your experience. And I LOVE the pig illustration - so sweet. Thank you,this is just what I needed to read! Really like your illustration style! Yes I did what you did re. books at the library. I would take out baby bug magazines and 30 illustrated children's books and also do research on the internet and then painted about 40 illustrations recently. I have also repainted pics. and now I know what was horrible wrong with the earlier ones.I am at baby steps for now. I also write. This is a fantastic post, Paige! Thank you for sharing. I will share it with my hubby tonight. You have unknowingly encouraged me to try, try, try again in the development of my sketches. When I have time. Oh, my! Great post. Thank you for sharing, I'm a big fan! Thank you for sharing! I love your work and have to admit it's encouraging to hear that at some point long time ago you were "awful" because that's where I am right now and it's a long road ahead.